Join Rachel and Kirsty as they meet their new fairy friend in this magical Rainbow Magic adventure! Lydia the Reading Fairy's magical star badge has been stolen by nasty Jack Frost. Without it, all reading lessons are ruined! 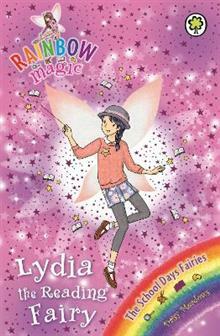 Can Rachel and Kirsty get it back from Fairyland and help their magical friend make reading fun for everyone again?